Genesee & Wyoming Inc announced on December 20 that the Surface Transportation Board had approved its application to take control of the RailAmerica shortline group. The change of control was expected to take effect on December 28, provided that no objections had been received by STB before December 24. Control of RailAmerica’s portfolio of 45 short line railroads totalling 12 000 km was placed into a voting trust when GWI completed its acquisition from Fortress Investment Group on October 1. 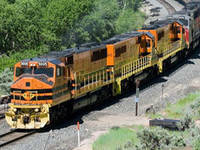 Following approval of the deal by STB, the company anticipated that the trust would be dissolved on December 28, allowing GWI to ‘assume control of RailAmerica and begin integration of the two companies’. When the acquisition was announced in July, GWI President & CEO Jack Hellmann said the ‘straightforward combination’ of the two organisations offered significant synergies, with cost savings of around US$36m expected to be realised within 18 months of the deal closing.